One out of two… – …STILL CRAZY AFTER ALL THESE YEARS! I was in the vicinity of this coffee shop one morning before Chinese New Year and I went in to the chu-char (cook & fry) stall there that we would frequent quite regularly to order their Foochow fried noodles but the young boy was all apologetic. He said that they would cook selected dishes and serve with rice but no, noodles of any kind would not be in their menu. He suggested that I ordered something from the kampua mee stall in front but I was not in the mood for that. …not that it mattered – I just went ahead and placed my orders and sat down to wait. …and when it was served, I thought it looked like the roti canai dough minus all the stretching and twirling to get it nice and fluffy and layered but cooked in the same way on a hot metal plate. No, I did not think it was anything that tickled my fancy – it was tough and rubbery and hard and tasted kind of doughy and even the very nice and spicy dhal dip could not save the day. …(roti canai with egg) that I also ordered was very nice so I guess it would be safe to assume that the roti canai would be great too. Well, thankfully, at least one of the two was nice though I was wishing they could be a bit more generous with the dip – I really had to stretch it towards the end so I would not end up eating roti telur plain, without any dip. Perhaps I could have asked for more but I did not do that. I can’t remember how much I paid that morning but I am pretty sure the total, inclusive of the kopi-o-peng, that I had was over RM4.00, probably RM1.00 for the roti prata and RM2.00 for the roti telur. RESTORAN CHEF ALIBABA/SALAM ALIBABA KAFE is located right beside SYARIKAT KIONG CHUONG CAFE (2.291062, 111.827381) along Jalan Kampung Nyabor at the bend where one turns left or right when coming from Brooke Drive, in the same block as Malaysia Hotel right next door. 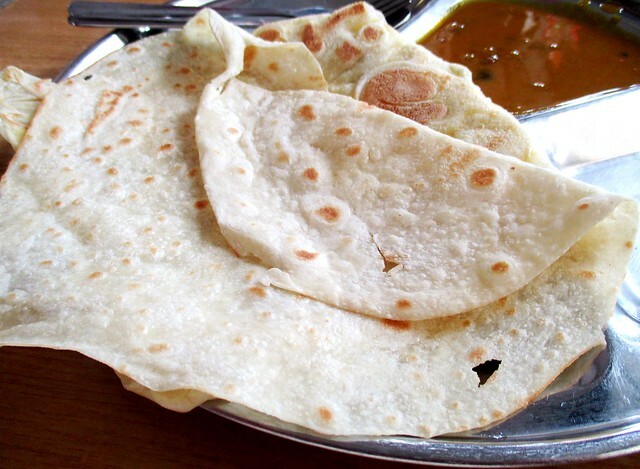 The photo 2 of the roti prata looks like chapati. Does it taste like chapati to you? It looks so alike and I eat chapati often and from your description of its taste, sounds like chapati too. Ah, so the chapati at Boss Guna tastes better! Though not a fan of this roti canai, roti prata, etc. but sometimes for a change I would choose to have roti telur or roti bawang. Roti telur looks good. 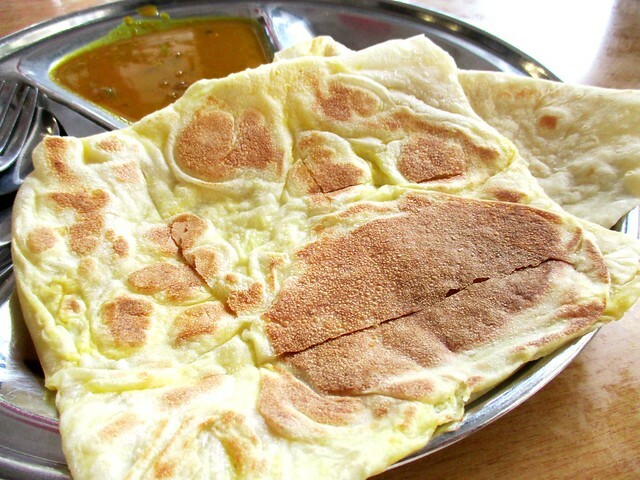 Roti telur or bawang are all roti canai with egg or bawang added, one and the same thing. 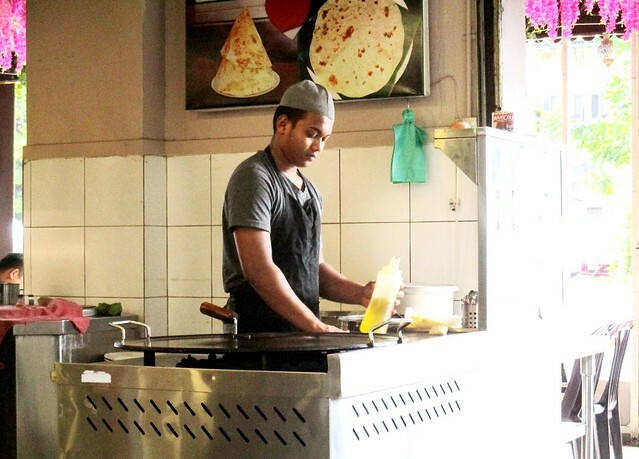 Yes, the roti telur here is good, not like an omelette. I went for capati and puri for last night dinner.. your roti telur looks very tempting… very neatly done too! I certainly would give them credit for their roti telur, the best I’ve had in town. Others come across like an omelette, not really crazy about it that way. Yah, I thought prata and roti canai are one and the same but looks like it is not. They are! I think the people here don’t know better – Chinese owners and Indian/Bangla workers – canai and prata are not Indian originals! I love dahl’s/dal’s!!! I have posted some vegan ones on my blog over the years! I have a store bought spinach Dal that I posted today, too! Not as good as homemade (or restaurant made) but good if you are on the go! Never heard of the combo beforem spinach and dhal. I love the Indian spinach dish, the palak paneer but it has Indian goat’s cheese in it, not for vegan. Ooh, I have my eye on that roti telur – that and roti pisang are my favourites. I don’t think I’ve seen roti pisang here – will certainly give it a try if I stumble upon any.